Whilst acknowledging fully how much his players were worthy of winning the Ulster title, manager Mickey Harte said he believed there was a bit of divine intervention in it. The Red Hands boss was understandably in jubilant mood moments after the final whistle signalled their first win over Donegal in five attempts in the championship so, when asked how he felt when Mickey Murphy was preparing in stoppage time for a free from almost the same 55m spot where he had sent the ball sailing between the posts a few minutes earlier, the manager admitted he was worried. “I thought that we were in God’s hands now. I felt that, if the ball had gone over the bar again, Donegal would have won the game. 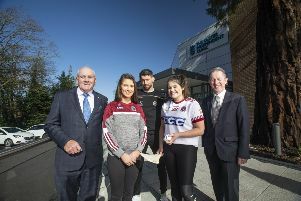 But, maybe thanks to God’s intervention, it didn’t go over and it was still all to play for,” stated the Errigal Ciaran clubman, who is well-known for being a man of great faith. “It looked like the game had got away from us but we bounced back. The work done, the hours and effort put in when nobody is watching, that’s what gives us the belief. “This is what you dream of. The hunger has been there for six years and it came out at the end of the game. “I know the qualities these men possess, they are a class act and I knew they had the potential to become winners. “We set out at the start of the year to win anything we could and so far we have done that well,” added Harte, whose team is still unbeaten since their return to action in December, also winning the O’Fiaich Cup, McKenna Cup and Division Two league titles.